First-time buyers Michelle Sparkes and her partner Ben Yard were delighted with the advice they received from the sales team at Saxons Plain about the Help to Buy – Equity Loan scheme. Thanks to the Government-backed initiative, they have now moved into a four-bedroom 'Wimborne' house type with their two children, Olivia and Michael. “I don't think we'd have been able to purchase our new home without Help to Buy, so it has really worked for us, and the team at Saxons Plain guided us through at every step,” explained Michelle. Terry and Vivian Woodjetts, who have purchased a three-bedroom 'Petworth' house type, said the extras that Bovis Homes offered were among the attractions, as well as on-site parking, a good-sized garden and reduced heating bills thanks to insulation and build quality. They are happy that the location offers everything they are looking for, with the bus and train station and local shops, pubs and restaurants, all within short walking distance. “The road connections to coast and country will enable us to explore by ourselves or with the grandchildren when they come to stay, by car or public transport,” said Terry. “The area seemed to put us at ease, offering a rural setting with a small-town feel with the transport connections. “We cannot sing the praises high enough for the sales team of Craig and Jo, whose help and assistance throughout the buying process has been fantastic. 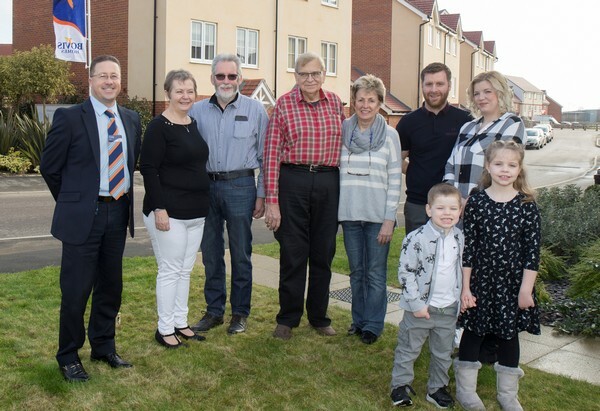 Jim Horan, who has purchased a three-bedroom 'Ferring' house type with his wife Andy, worked on building projects with Bovis Homes during his career in the contracts business. “From experience, I know Bovis Homes is a good outfit,” said Jim. “We were looking for a house with slightly more room than what we had in Littlehampton and the layout of the Ferring suits us. “Worthing is an enjoyable place to shop in, with plenty of parking, and we have friends in the area. Communication with the customer throughout the buying process, and onwards through the two-year warranty to ensure any items around the home are dealt with, are key to the Bovis Homes experience. To ensure customers are happy with their new home, Bovis Homes teams carry out a thorough Home Demonstration of all appliances and systems before they move in, to help customers fully understand and appreciate all the benefits of their new property.